"Why should I wait? She knows peanut butter and oatmeal are my faves!" Oats and peanut butter are a tasty twosome to put into homemade cookies for your dog. They both bring nutritional value to the table, and the taste combination is hard to beat. And with the love you bake into Fredo's homemade treats, you'll have an eternally grateful pup. You already know peanut butter is one food Fredo won't turn down. It's useful for stuffing into a dog toy to keep your pooch busy or for hiding medication when it's time to slip him a pill. It's nice to know that it's good for your pup, as well. Peanut butter is a valuable source of protein, vitamins and minerals and it provides healthy monounsaturated fats while still being low in cholesterol. When shopping for a jar of peanut butter to use in Fredo's oatmeal cookies, opt for the natural variety that doesn't have salt or sugar added to it. You probably haven't mixed up a bowl of oats for Fredo lately -- or maybe ever -- but as a healthy source of carbohydrates that has a high level of minerals, it's a beneficial ingredient to add to a peanut butter cookie for him to munch on. Oats and oatmeal are high in fiber, too, so they help to make your dog feel fuller, which can be helpful for an overweight dog who loves treats. The fiber from oats also regulates Fredo's digestive system. Sure, there's an abundance of doggy treats on the shelves at the supermarket and the pet supply shop, so you might wonder why you should spend time home-making cookies for your dog. The number one reason is that you'll know that all the ingredients that go into them are healthy. Just take a look at the label on one of his treat bags. While there are healthy, natural dog treats available, most have a list of chemicals and un-pronounceable words. You'll probably save money, too, by making Fredo's treats yourself. Most dog cookie recipes call for ingredients that you probably already have in the pantry -- like oatmeal and peanut butter. Oat-filled peanut butter treats are so simple to make, you and Fredo will both wonder why you haven't done it before. Start by powderizing enough oats in the blender or food processor to make one full cup. Then put the oat powder with 2 tablespoons of corn oil, 1/2 cup of peanut butter, 1 cup of water, 1 cup of uncooked oatmeal and 1 cup of all purpose flour into a large bowl. Mix the ingredients together to form a cookie-like dough, then roll the dough out to 1/4 inch thickness on a floured countertop. You can use cookie cutters to cut out shapes or just use a knife to cut the dough into squares. Place the biscuits onto a cookie sheet that has been sprayed with cooking spray and pop them into the oven, preheated to 350 degrees Fahrenheit. They should be done after 20 minutes, but you can leave them in the oven after you turn it off to allow them to get extra-crispy. Just make sure the cookies are thoroughly cooled before you let Fredo eat them. Fredo will be happy simply to get a homemade treat from you, but you know what they say; variety is the spice of life. Literally spice things up for your pooch by adding 1/2 teaspoon of cinnamon to his cookies. 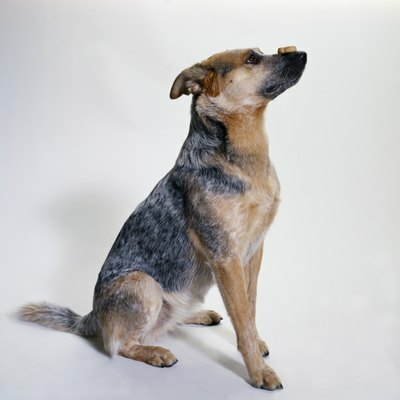 Mixing in 2 tablespoons of molasses or applesauce will give your dog cookies an appealing and appetizing flavor, too. If you don't have time to bake, you can melt 1 cup of peanut butter on the stove or in the microwave and dip store-bought dog cookies in it, then roll them in uncooked oats. Or you can always mix up a dog candy treat with 1/4 cup peanut butter, 1 cup of quick-cooking oats, 1 cup of honey, 1 teaspoon of vanilla and 1/4 cup of milk heated with 1/4 cup of margarine until the margarine melts. Just drop the mixture on a sheet of waxed paper using a teaspoon and allow the canine candies to set up before feeding them to Fredo.